This tutorial solves a common problem for people who regularly write bids. The RFP – request for proposal – contains several requirements. It is therefore good practice to send such matrices. Unfortunately most RFPs have no formalized requirements. The only way to identify a sub-part of the RFP is to use the chapter numbers. In this case, you have to create a table in your bid presenting where and how each RFP chapter has been covered. Have you never dreamed of a simple method for automatically building and updating this matrix? The first first step consists in creating a project and including the files: RFP and proposal. First of all you must create the project file. To make things easier all documents can be stored in the same folder, for example called ‘matrix’. Right click on the RFP, then click on “Add to coverage” menu to create an empty project. Select the RFP in the file list. Select ‘Heading’ in the ‘Data Source Information’ section. Click on the ‘Edit’ button and force the file code to ‘RFP’. Click on the ‘Add File’ button. Select the bid file in the file browser. In this example the name is ‘My BID.docx’. Select the BID file from the file list. Select ‘None’ in the ‘Data Source Information’ section to skip the heading of the bid itself. Click on the ‘File’ menu, then ‘Save’ to save your modifications. Insert a coverage tag wherever your proposal answers a chapter, or part of a chapter, of the RFP. 12.1 The project will commence on 1 February 2015, and will be completed by 31 July 2015. 12.2 Dates of commencement and completion of the project shall be stated in the contract. The project duration is 6 months. The project starts 2 weeks after order. The <<RFP§12.0>> text is the tag indicating that this chapter fully covers the requirements of RFP chapter §12.0. To keep the proposal legible, tags are usually written in grey in a small font. Good practice recommends using a Word style. In this way you can, if required, hide tags by selecting font size 1 and white. <<RFP§12.0>> #Partial means that not all requirements are covered here. <<RFP§12.0>> #Uncovered means that requirements are not covered in the proposal. The final coverage rate will be reduced. <<RFP§12.0>> #NA means that requirements are not applicable to the scope of the bid. They will be ignored and the the final coverage rate will not be reduced. <<RFP§12.0>> #Uncovered 25% means that only 25% of requirements are not covered. This allows a fine tuning that presents the highest rate possible to the customer. <<RFP§12.0>> #C this is a comment will register a comment in the coverage matrix. This is a custom coverage tag. 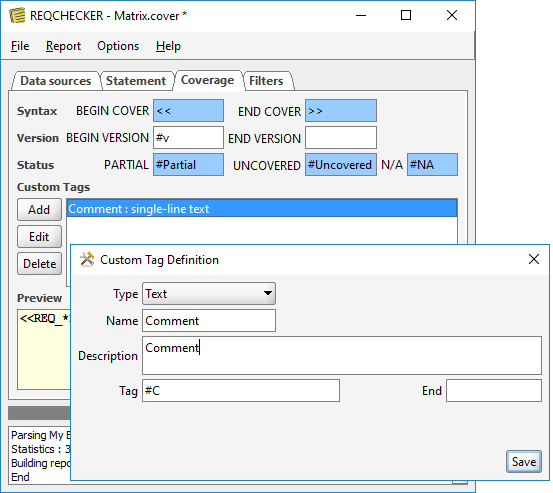 It is possible to create several tags to manage coverage. All of these can be combined. For example : <<RFP§12.0>> #Partial 50% <<RFP§12.0>> #NA 25% <<RFP§12.0>> #Uncovered 25% #C This will be covered by a another proposal. means that 50% of this chapter is covered, 25% is uncovered and 25% is inapplicable to the bid. 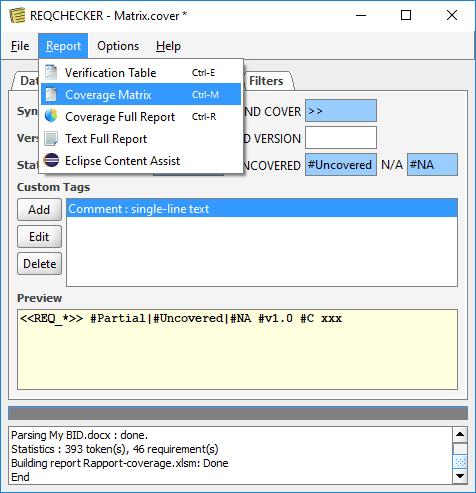 Click on the ‘Report / Coverage Matrix’ menu to build the EXCEL matrix. You can either copy the matrix into your proposal, or click on the ‘Report / Coverage Full Report’ menu to attach the detailed PDF version. Here you can replace the RFP with an updated matrix, or update your proposal. Even if you move chapters of your proposal or text around, or if you make any other kind of modification, just re-compute the report to get an updated matrix within a few seconds. It's really refreshing to discover a little software that does its job well and provides for significant savings in terms of management for medium-sized projects.